For today’s game day blog, I thought I’d share the fruits of some of my musings on Warhammer 40k since I spent the best part of a weekend sorting out how I’m going to field the legions of little people that I have right now. It’s been a very exciting time, I have to say, so I’m excited to share it with you all! First of all, I’m sure by now you’ll all remember the combined AdMech/Militarum Tempestus army that I’ve been thinking about for a while? 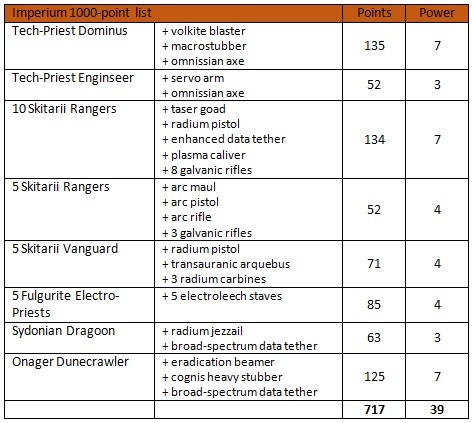 Well I’ve been looking into getting the AdMech part ready for a tournament at my local game store at the end of October, so was working on a 1500-point list of Skitarii and the odd Tech Priest. What a glorious list that would have been! The only problem, of course, is that I would need to buy more miniatures than I already have, and the enormity of the task was somewhat getting to me… I mean, the total project weighed in at 1468 points and 66 miniatures, of which I’ve currently only painted one five-man Skitarii Ranger squad. It’s with a bit of regret, then, that I think this army project will likely not be ready inside of a month… But I’m going to continue on with it for the time being, as I really do like the idea of having a wave of Skitarii robot-men marching across the field implacably! 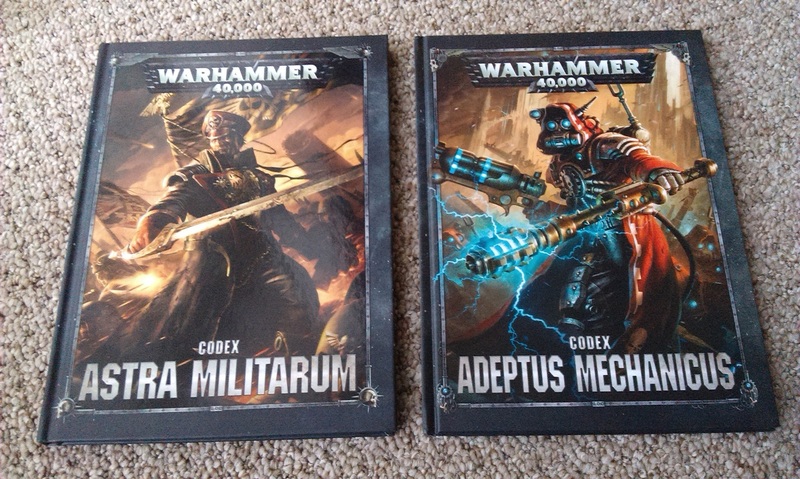 I picked up the Codex for the AdMech when it dropped, and also the Guard Codex when that came out at the weekend. What a pair of books!! A lot of people have been really tearing the AdMech to pieces, whereas the Guard have had nothing but glowing reviews – indeed, it seems right now, they’re the most powerful army in 8th Edition! So I’m intrigued to see how a combined army would fare. Of course, my own Guard contribution is Militarum Tempestus, which seem to have come off the worse in comparison with the other Regiments in the book. However, the models are so damn amazing that I would never let a small factor like the rules get in the way of me enjoying them! So before I move on, let me talk about the planned army that I have right now. 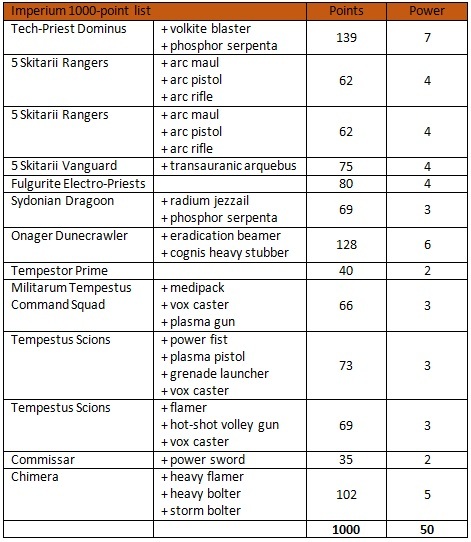 The original army list for the Scions that I posted back when I was working from the Index came in at 385 points, very much a subsidiary portion of the overall force. 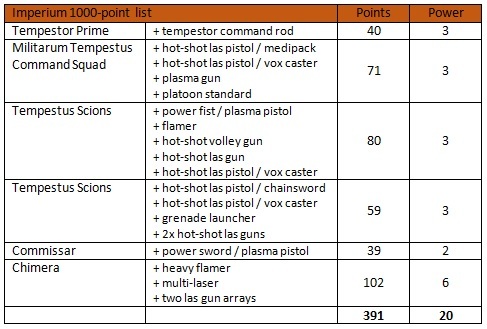 I’ve not actually changed the load-out, from what I can see, but my new Tempestus force weighs in at 391 points, so still not exactly a massive part of the force. I’ve since bought another box of Tempestus Scions, and the Start Collecting box, as I managed to find both at a reasonable discount. It’s probably important to note, I’ve never owned a Guard Codex previously, so I’ve never really been aware of the make-up of the army. Reading through the new edition at the weekend, though, I was quite impressed to discover that this list, plus the kits I have yet to build, make up a single Militarum Tempestus Platoon! Exciting times. I do enjoy having the proper organisation for these things, after all. On the whole, then, I have a Skitarii Battalion and a Tempestus Patrol detachment, so I’ll be getting the grand sum of 9 command points. So what can I do with all these things? As for the Codex Adeptus Mechanicus list of Stratagems, I’m not entirely sure if I’ll be using a great deal. I do like the Protector Doctrina Imperative, allowing for +1 to hit in the shooting phase (+2 if the unit has an enhanced or broad-spectrum data tether) – as I’m seeing the AdMech primarily as a gun-line army, I think it’ll be really useful to bolster them like this. I don’t have a Forge World for my army, so I’ve been taking a look through those in the book, and overall I think I like the look of Metalica – it was originally going to be my colour scheme, after all! So I think I’m going to have them as subsidiaries of the Metalica FW and go from there. This has been an incredibly long ramble, so well done if you’ve made it to the end here! I’ve been very excitedly looking at my Dark Eldar collection in a similar vein, but I think I’ll wait for a bit before writing up my thoughts on the space pirates. October will definitely be a time for trying to get more of the AdMech and Tempestus guys finished for the tabletop, so I hope that I can soon get to my local store for some games! Thanks, man! I’ve not read that, is it worth a look? There’ll be plenty of updates here, I’m sure! !